Yes, yes I did a transgression. Instead of making Italian espresso coffee with a moka pot, I used a mug full of instant coffee. Well, don't blame me if I did so. I only thought at those that don't possess the moka pot espresso machine. I just figured out a way to substitute Italian espresso keeping the best coffee taste possible. Warm-up the water and make the coffee with 3 tsp (15g) of Nescafé™ classic coffee and 2 tbsp (30g) of sugar. 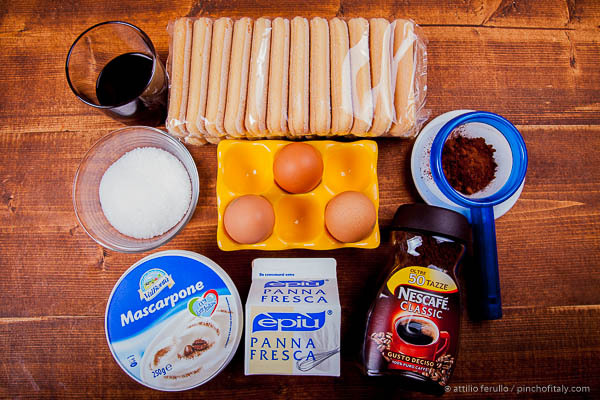 Crack and beat the eggs with about ¾ of the sugar, once done add the mascarpone cheese and mix in. 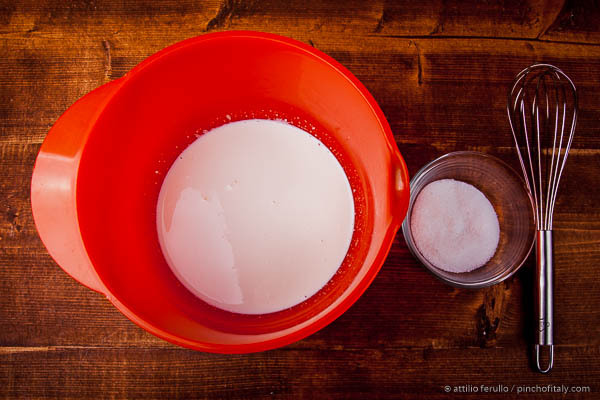 In another bowl pour the whipping cream with the remaining part of sugar and beat until whipped. 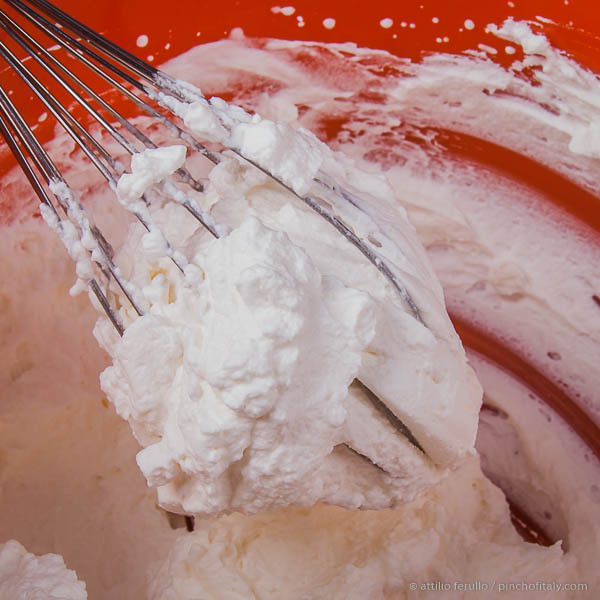 Add the whipped cream to the eggs and mascarpone and mix well until a soft-cream compound is formed. In an 8-inch (20x15x6cm) casserole dish pour a little coffee over the bottom. 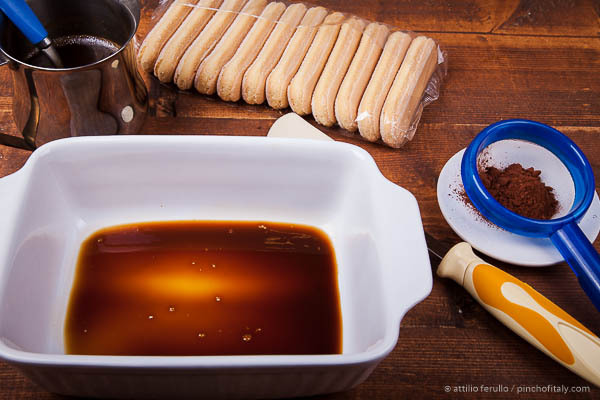 Start making a first vertical layer of savoiardi (lady fingers) and pour 3 spoons of coffee over each biscuit. 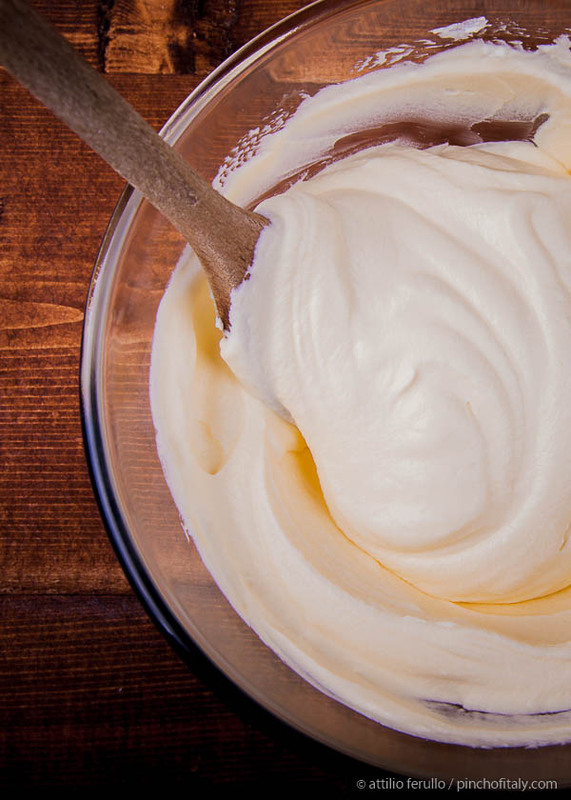 With half of the filling cream previously made and the help of a spatula cover and spread evenly the layer. Sprinkle over some cocoa powder. 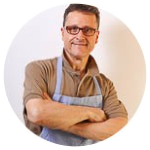 Make the second and final layer horizontally by repeating the same procedure as the first. 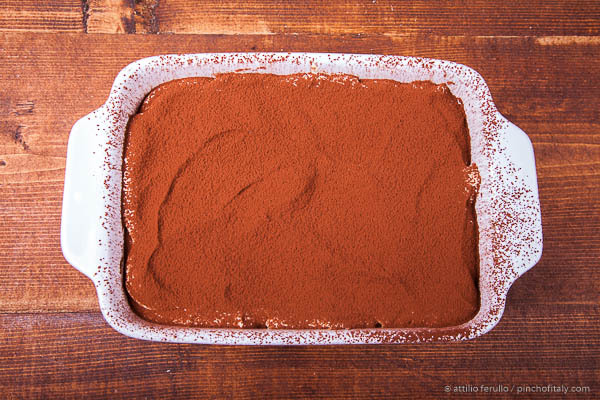 Sprinkle more cocoa powder over the top and rest it for at least 4 hours in the fridge and you will have the best homemade tiramisù. 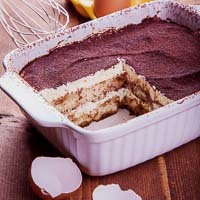 Many recipes for tiramisù make use of egg white to form the cream. After a few trials I found out that the addition of whipping cream instead of egg white makes a much more firm-solid creamy compound. Then just needs 4 hours of rest in the fridge before serving. It is important to make sure that eggs are truly organic and from hens grazing free. Eggs from factory farms, are much more likely to be contaminated by pathogenic bacteria such as salmonella. Warm-up 8 fl. oz. (250ml) of water, add 3 tsp (15g) of classic instant coffee and 2 tbsp (30g) of sugar too. 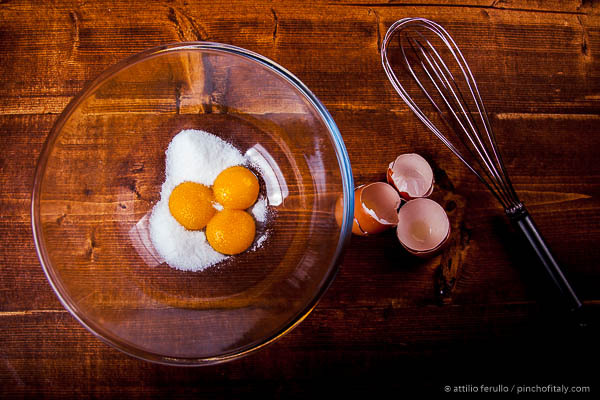 Crack 3 yolks of eggs in a bowl, add just a part about 2 oz. 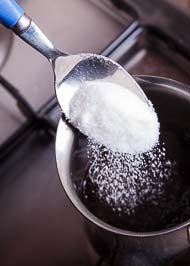 (60g) of sugar and start beating together. Add 8.5 oz. 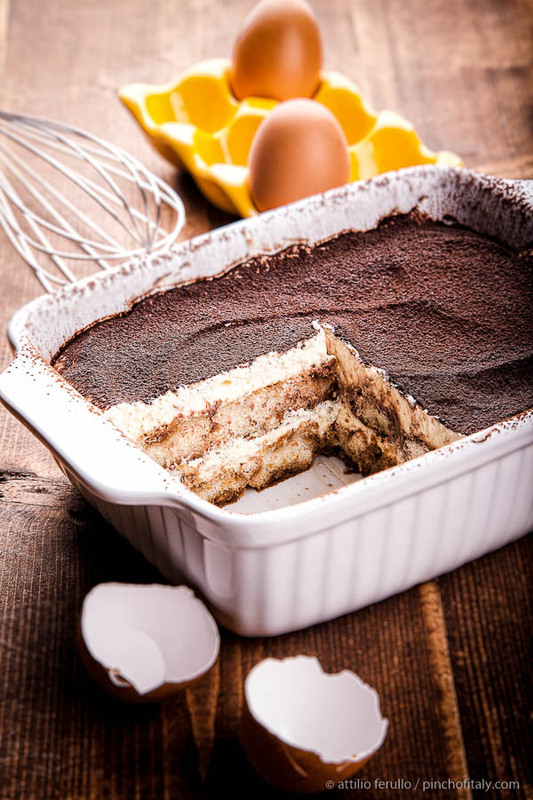 (250g) of mascarpone and beat with the eggs and mix well. In another bowl pour 8 fl. oz. 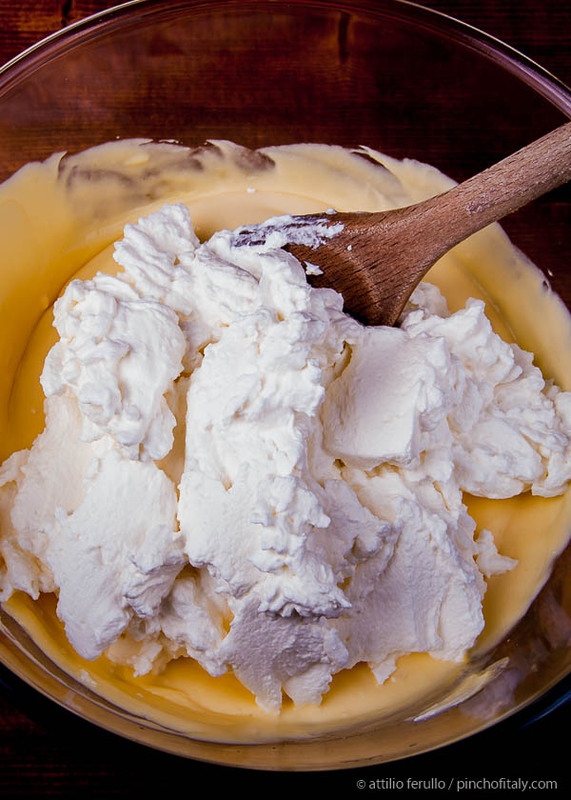 (250ml) of whipping cream with the remaining part of sugar and beat until whipped. 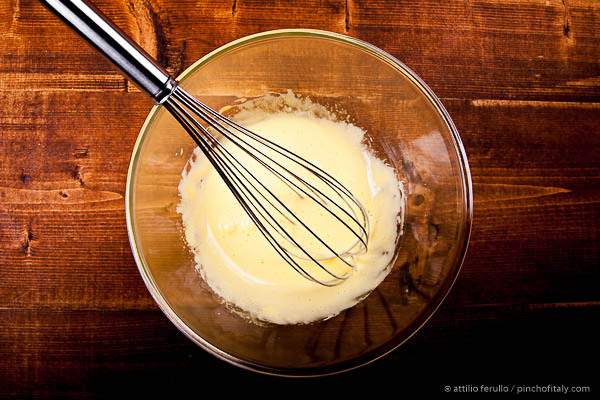 Add the whipped cream to the eggs and mascarpone and mix again from up to down until a soft-cream compound is formed. 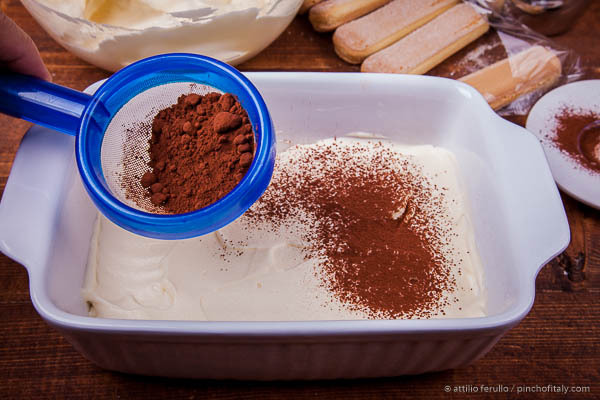 The creamy filling is ready so it's time to assemble the tiramisù. I used an 8-inch (20x15x6cm) casserole dish (tall enough to make 2 layers) and poured over the bottom a couple spoons of coffee. 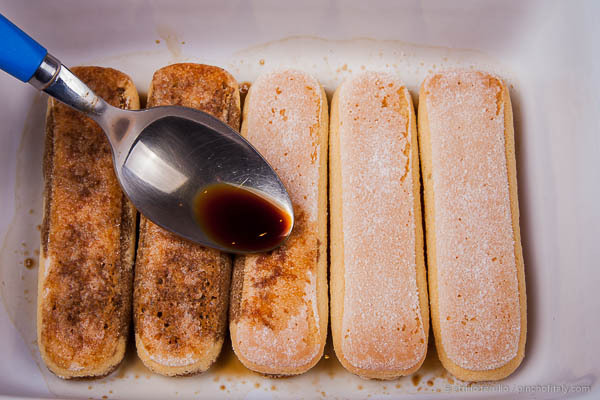 Start making the first layer of savoiardi and pour another 3 spoons full of coffee over each one. 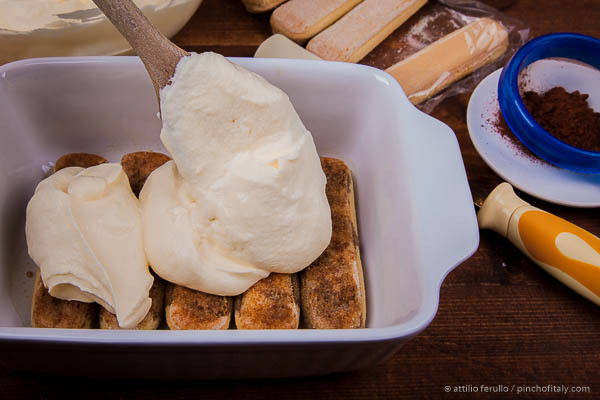 Take about half of the creamy compound with a spatula and spread evenly over the savoiardi. 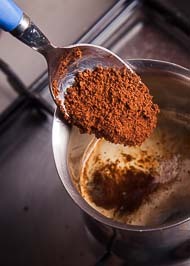 With a sifter half-full sprinkle some cocoa powder over the first layer of savoiardi. Repeat the same process as above and make the second layer. This time place the savoiardi horizontally and when necessary break in tow to fit them in. Cover with the other half of the creamy compound and the second layer is done too! Finally sprinkle more cocoa powder over until completely covered.